New Delhi, April 2: The Congress on Tuesday unveiled its manifesto for the coming Lok Sabha elections seeking to bring the narrative to "real issues", compared to the BJP's "hyper-nationalism" with party chief Rahul Gandhi stressing on five big economic and social ideas including Nyay that will provide Rs 72,000 a year to 20 per cent poorest families. 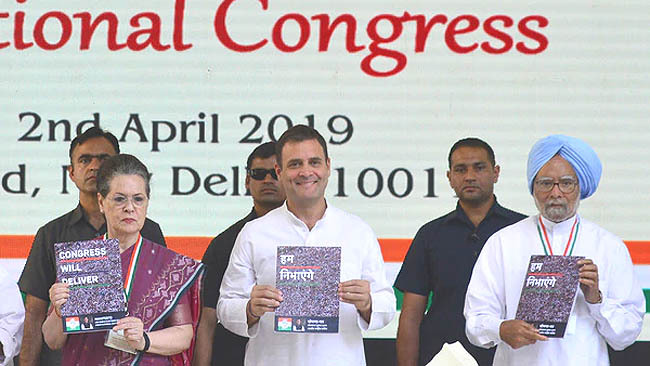 Releasing the manifesto - 'Congress will deliver' - along with UPA chairperson Sonia Gandhi and former Prime Minister Manmohan Singh at the party office here, Gandhi made repeated attacks at Prime Minister Narendra Modi, accusing him of "lies" and failing to deliver on promises. Gandhi accused Modi of being afraid and "hiding" from reality about the problems of youth and farmers and challenged him to debate with him on issues such as corruption, foreign policy and national security. He said narrative of the elections has already been set and it is Nyay and unemployment and distress of farmers were the main issues. "Narendra Modi has got shock effect. Chowkidar can hide but he cannot run away. The truth is before people. We will defeat him in the elections," Gandhi said. In a dig at Modi, he said the manifesto speaks the "man ki baat" of the people. "The moment we speak about Nyay, we get response from people. There are five big ideas in the manifesto. There will be 'Garibi par waar' (attack on poverty), Rs 72,000 will be provided to 20 percent poorest families in a year. The money will go directly in the pockets of poor and the economy impacted with demonetisaton and flawed implementation of GST will jump start," he said. He identified employment, farmers, health and education as the other big ideas. "We will fill 22 lakh government vacancies by March 2020 besides employment to 10 lakh youth in gram panchayats, entreprenuership will be boosted by waiving off permissions (for three years) for a new business and the rural income guarantee scheme MGNREGA is being extended to a minimum of 150 days in a year compared to 100 at present," he said. Gandhhi said farmers will be given a loan waiver and there will be a separate budget for farmers so that they know how much is being given to them. Accusing Modi of being pro-rich, he said farmers who fail to return bank loans will no more face criminal action but only civil cases. Gandhi said 6 per cent GDP will be spent on education and high quality education will be made more accessible. Not ruling out being the prime ministerial candidate of the party or the opposition alliance, the Congress President, asked if the media was interacting with "a future Prime Minister", said: "It is on the country, not on me. I do my work. You have to ask this question to the people." Attacking the Modi government's ambitious Ayushman Bharat scheme as one to benefit insurance companies more, he said that the Congress does not have as much faith on private-institution based health care. "We will strengthen public health institutions," he said and added that the endeavour of a Congress government will be to provide best medical facilities to the poorest. Tp BJP's criticism that the Nyay scheme was "not workable", he said: "I agree it is not doable for the BJP. But it is doable for the Congress." Asked why he was also contesting from Wayanad in Kerala apart from Amethi, Gandhi said: "South India feels hostility from Narendra Modi... They feel they have not been included in decision making" and his candidature would send out a message that "we are with you, I am with you." Rejecting suggestions that the party has not been able to stitch pan-India alliances, he said that the Congress had tie-ups in Bihar, Jharkhand, Tamil Nadu, Maharashtra and Jammu and Kashmir. Earlier, former Finance Minister P. Chidambaram, who headed the manifesto committee, said that the manifesto was aimed at creating wealth and guaranteeing delivering welfare. "A Congress government under Rahul Gandhi will do it," he said.